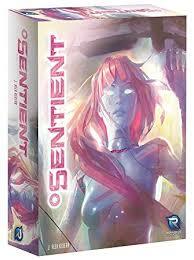 Sentient is a set-collecting game with a bit of area control and also a bit of dice rolling. It is published by Renegade Games. I've enjoyed several other games by this publisher, they seem to release the kind of games I generally like. Each player has 5 coloured dice and rolls them to place on their own board. There are spaces in between the dice for 4 cards. The cards are selected from a central display and are 'paid' for with workers (Agents) and optional 'Assistants'. Cards have symbols in the top corners which might increase or decrease the number on the dice when you place them in your display. 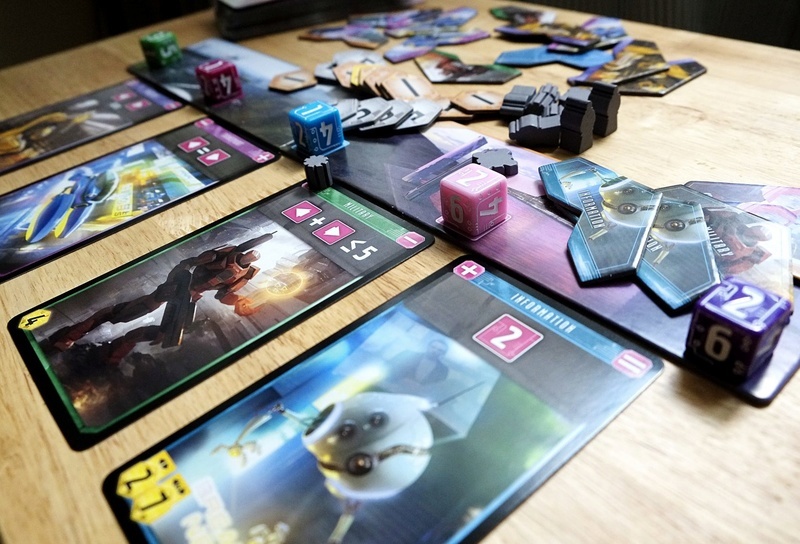 The cards also contain a formula which will score points if the dice are set correctly at the end of a round. For example if both dice are even or if they add up to 7. At the end of each round players receive 'Investor' tokens based on the Agents and Assistants they placed previously. These tokens are used for end-game scoring. After 3 rounds of play, points are totalled and highest score wins. The game looks great, the card art is futuristic and coloured in bright pastel tones (the box cover is quite pink!). Each player has 5 coloured dice which are nicely detailed and roll well (even though you only roll them 3 times in the game). The theme however of programming sci-fi bots is not really relevant. The game has good strategy and tactics, you have a decision each turn of which card to choose, and where it will go in your display. When you place the card it will change the dice so you need to be careful and have a plan in place. Sometimes a card comes up which exactly fits your plan and this feels great. The type of card taken is also important, along with which investor tokens you want to get at the end of the round. There is a lot of forward planning in this game and it really is a lot of fun when it all comes together. Really enjoyed this game, it's quick (its just 3 rounds and you choose 4 cards each round) and has plenty of decisions to make and a satisfying overall arc.